Where did Preston North end? Another family mystery this week, this time from across the Atlantic with a story which starts in the small Lincolnshire town of Brigg in England. The person we’re interested in is a man called Preston North, a tailor who was born there in 1859 to Frank and Jane North. By the time of the next census, in 1911, Martha is listed, still living in three rooms in Paradise Place with her six sons (Harry is the youngest, born after the 1901 census), but Preston is not at home that night and is not to be found anywhere else in England through the census records, although the fact that Martha lists herself as married rather than widowed suggests that Preston is still alive somewhere. We don’t have access yet to the 1921 census records, so will have to wait a few years to see what they might tell us. What we do know is that Martha died in Brigg in 1924 and by 1933 Preston North was living in Deseronto. 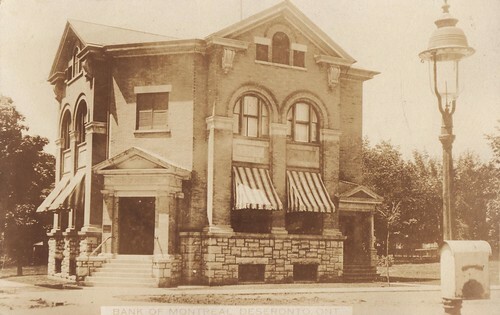 In that year he sent a postcard to his grand-daughter in England which showed the Bank of Montreal in the town (the building which is now the Town Hall). On the postcard, Preston North noted that the bank had closed down due to lack of business (this happened in 1932 as a result of the Depression). 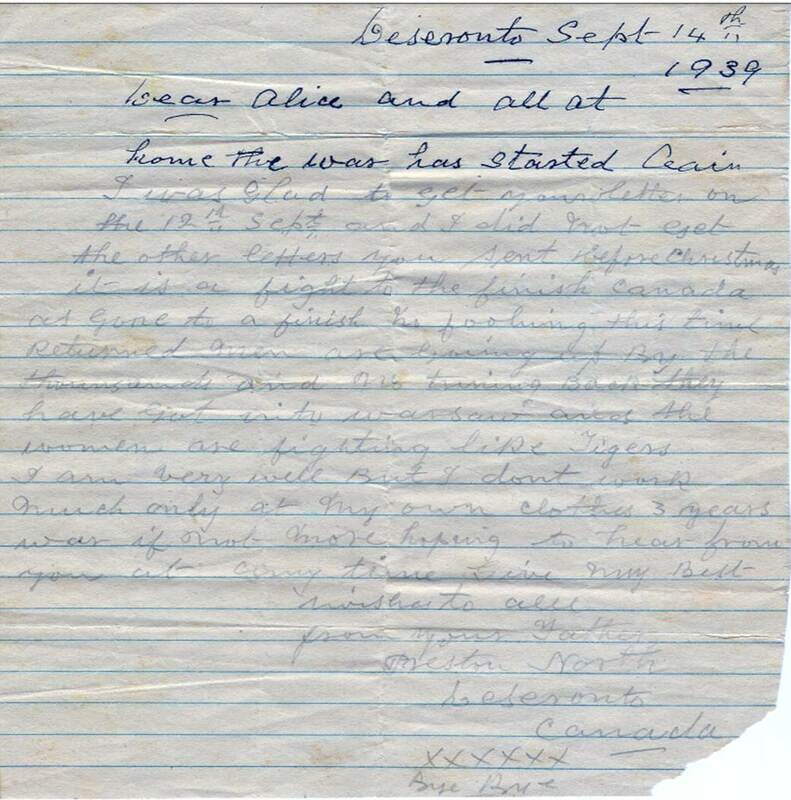 His great-grand-daughter also owns a letter which was written in Deseronto by North in 1939 (when he would have been eighty years old). I was glad to get your letter on sept 12th and I did not get any other letters you sent before Christmas. It is a fight to the finish Canada has gone to a finish no fooling this time. Returning men are going up by the thousands and no turning back. They have got into Warsaw and the women are fighting like tigers. I am very well but I don’t work much only at my own clothes. 3 years war if not more. Hoping to hear from you at any time. Give my best wishes to all. The story in the North family in England is that Preston started another family here in Canada and never returned to England. They don’t know where or when he died, or when precisely he came to Canada. Some new information about John Preston North has emerged. On June 19th, 1915 he married Chloe Anne Lalond in Kingston, Ontario. He claimed to be 42 years old (he was actually 52) and a bachelor who had been living in Kingston since 1910. This would explain his absence from the 1911 UK census. There was a family story that this man was a bigamist, and this evidence seems to confirm that this was the case. In 1916 John Preston North was living in Napanee when he signed up to join the Canadian Expeditionary Force. By this stage his real age was 57, but he claimed to have been born in 1872 and to be 44. So not only was North apparently a bigamist, but he also seems to have been a habitual liar!